The Catholic Cemetery was established in the summer of 1897 by Mr. James McNeil, then owner of the Grand Hotel. Mr. McNeil lost his young wife Sadie during the birth of their daughter (also named Sadie). Daughter Sadie died one month later. 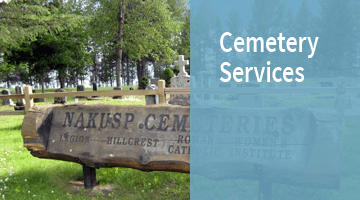 Mr. McNeil purchased the property specifically to bury his wife and daughter and designated it the Catholic Cemetery. Upon his passing, Mr. McNeil was also interred in the Catholic Cemetery in an unmarked grave. Located on the bench below the Catholic Cemetery, this extension was mapped out in 2009.